The kiwiFLOOR sprung subfloor system is designed for permanent installation over virtually any existing surface. 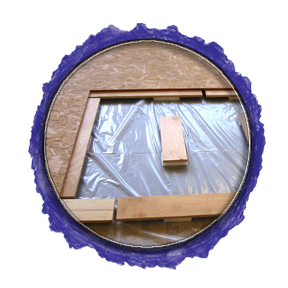 It combines the structural support of Oriented Strand Board with the spring and durability of closed cell foam pads. It is a domestically made, sustainably made, green product that can be helpful in LEED compliance. The kiwiFLOOR can be installed over virtually any existing floor by securing the perimeter of the new floor to the old and then laying the pads and panels and interlocking them on specially constructed sleepers. At a total height of 2 1/2", when it is sealed and planed, it makes the ideal sprung subfloor for any finish floor surface, including vinyl/pvc, ("marley"), resilient dance floors "dance floors," hardwood, tap tiles, and gymnastics matting.